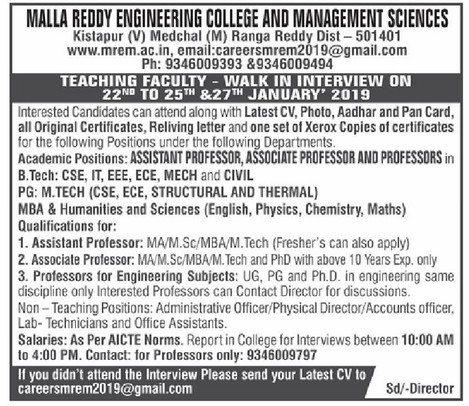 Malla Reddy Engineering College and Management Studies, Ranga Reddy has advertised in the EENADU newspaper for the recruitment of Teaching Faculty- Professor / Associate Professor / Assistant Professor Plus Non-Faculty jobs vacancies. Interested and eligible job aspirants are requested to walk-in 22nd, 23rd, 24th, 25th and 27th January 2019. Check out further more details below. About College: Our mission is to embrace the pursuit of excellence both inside and outside the classroom. We encourage critical thinking and emphasize the learning process over rote memorization. How to Apply: Interested and eligible candidates are requested to attend the Walk-in interview along with CV, all originals, copies of certificates, PAN card, Aadhaar card, Reliving Letter and recent passport size photos to the walk-in address given below.